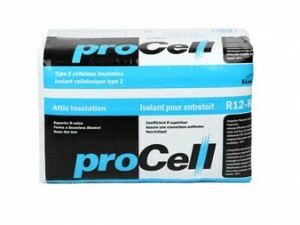 Thermoshield is a dry blown-in Type 1 cellulose Fibre Insulation (CFI) that is designed to increase the insulation value of your attic and walls and reduce the airflow leakage from your home. It is manufactured from recycled newsprint that has been reduced to fibres and impregnated with a blend of borates and sulphates to add fire resistance and deter mold, mildew, rodents and insects. ThermoShield can be installed in an open attic up to a 4.5/12 pitch and using the correct professional equipment it can be dense-packed into walls to provide a high R value , low leakage, very quiet and tight wall construction. 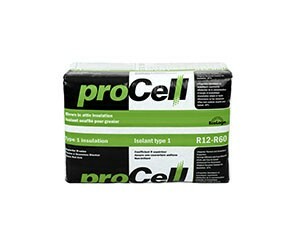 ProCell Green is a dry Blown-in Type 1 Cellulose Fibre Insulation designed for the professional contractor. 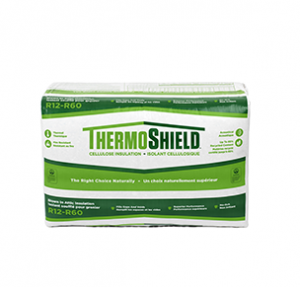 Like ThermoShield it is manufactured with recycled newsprint that has been fiberized and impregnated with borates and sulphates to add fire resistance and deter mold, mildew, insects and rodents. In addition, a dust-control agent is added to improve conditions in the attic for people who do this every day. It is very effective at increasing R value, increasing your homes air tightness and reducing noise levels from outside. It can be blown into your attic or dense-packed into your wall. 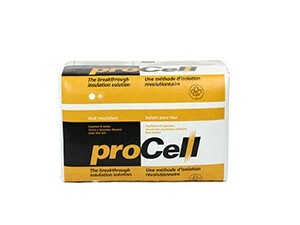 ProCell Blue is an all-borate Type 2 stabilized cellulose designed for spray application with water to ensure that it does not move post-application. Like all cellulose insulation it begins with recycled newspaper that is shredded down to fibres and then those fibres are impregnated with a blend of borates to provide fire resistance as well as deter mold, mildew, rodents and insects..
EnviroShield is a dense-pack wall system that utilize our Type 1 cellulose insulation (ThermoShield or ProCell Green) that is machine-applied behind poly or mesh netting at 3.0 lbs/sq. ft. You must be a certified installer to apply this application technique. EnviroShield exhibits superior thermal and acoustical properties, in addition to its fire retardant feature.